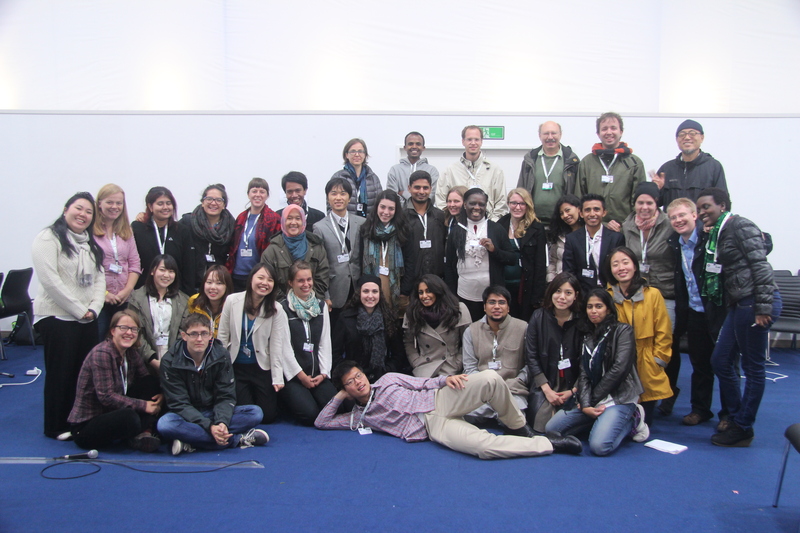 Global Youth Biodiversity Network | What's with the Climate? The following intervention was made on agenda item number 29 “Stakeholder Engagement” and “Engagement with Sub-national and Local Governments” of draft decision text in Working group II dealing with Ecosystem Conservation and Restoration. As local governments can utilize energies and experiences of young people for strengthening urban environmental governance framework and implementation of various programmes mentioned in the draft convention text. Categories: Convention on Biological Diversity, COP12 | Tags: Global Youth Biodiversity Network, Kabir Arora, Strategic Plan for Biodiversity 2011-2020 | Permalink. The following intervention was made on agenda item number 26 of draft decision text in Working group II dealing with Ecosystem Conservation and Restoration. Madam Chair, thank you very much for giving us the opportunity to share our inputs in regard to this item. We are speaking on behalf of the Global Youth Biodiversity Network. With the current rate of biodiversity loss, we as youth are extremely concerned about the national commitments regarding conservation and restoration. We understand that it will not be possible to conserve earth’s biological diversity through the protection of critical areas alone. Therefore, damaged ecosystems need restoration activities to be recovered. We believe that the main efforts should focus on in situ conservation of natural areas, following the Ecosystem based approach. Global Biodiversity Outlook 4 shows that there is a tangible bias on the geographical patterns of restoration projects, with the highest investment levels in North America and Europe, and we are aware that high costs and technology requirements will limit its application in many developing countries. In addition, the complexity of tropical and subtropical ecosystems require strong scientific basis to implement restoration projects when damaged. Therefore, we remind parties that the Preventive, Precautionary and the Polluter Pays Rio Principles, are crucial to ensure that restoration is additional to ongoing conservation efforts, otherwise it cannot count towards the Aichi target 15. We call parties to ensure that conservation of fragile ecosystems is the highest priority, while restoration strategies should be applied only on ecosystems that have already been damaged. Also, we strongly believe that restoration must not be used as an argument to legitimize the degradation of natural areas in other places via biodiversity offsetting, and it is extremely important to recognize that plantations as a form of restoration is not acceptable. We believe that Initiatives such as the Indigenous People’s and Community Conserved Territories and Areas (ICCAs) are very successful options and should be promoted. Tenurial security for indigenous peoples and local communities must be ensured, as well as the recognition of their customary practices and their free and prior informed consent (FPIC) in conservation and restoration initiatives. In this regard, national policies should make greater efforts to achieve the full scope of Aichi target 11. Moreover, financial and human resources should be managed by local people. Science and technology should go in hand with all biodiversity values and the people’s needs. It must be ensured that restoration and sustainable use of inhabited ecosystems are led by communities taking the central role with support from governments , while civil society efforts, including the private sector, must be recognized but not prioritized as hinted in 2 & 3 (b) of the draft decision document. We call on Parties to take the commitment of developing coherent strategies, programmes and policies at the national and subnational levels that combine conservation of fragile ecosystems with restoration of areas that have been degraded. These strategies must address at the first stage the direct drivers of biodiversity loss such as oil prospection, roads or mining on fragile ecosystems. Please remember that the well-being of the world population in the coming decades will largely depend on conservation and restoration of ecosystems to maintain and enhance biodiversity and ecosystem services, thereby contributing to sustainable development while reducing environment related risks. Therefore, when taking any decisions we must ensure that the rights of the coming generations are fully respected. Categories: Convention on Biological Diversity, COP12 | Tags: CBD COP12, Global Biodiversity Outlook, Global Youth Biodiversity Network, Kabir Arora, Michelle Pazmiño, Mirna Inés Fernández Pradel | Permalink. The following intervention was made on agenda item number 24 of draft decision text in Working group II dealing with “Synthetic Biology“. Madam Chair, thank you very much for giving us the opportunity to share our position in regard to this item. We are speaking on behalf of the Global Youth Biodiversity Network. We are representing future generations, and as so, we strongly urge parties to consider the precautionary principle when discussing this matter as we strongly feel that the risks and negative impacts imposed by synthetic biology are still unforeseeable and are not being taken fully into consideration. Scientific knowledge on the future implications of this issue is not yet mature, therefore synthetic biology is a new and emerging issue that has to be taken into account as highly relevant and influential to socio-economic and health issues. Apart from robust unbiased scientific knowledge, it is essential to carefully analyze the economic and cultural impacts of this emerging issue before making any decision. It is hinted that parties may facilitate private sector involvement for strengthening human resources and developing institutional capacities in synthetic biology. In this sense, we would like to remind parties that the involvement with all stakeholders including business sector is necessary, but due to their political power, we fear that their interests will steer the research and capacity building activities as well as the decision-making process regarding synthetic biology legislation which may hamper the process of strengthening human resources and developing institutional capacities. We would also believe that is extremely necessary to have a legally binding framework if not at international level at least at the regional and sub-regional level between various governments with the aim of ensuring safety standards to avoid by all means the risk associated with synthetic biology as it moves beyond national boundaries and moves beyond time, posing as a threat to all the future generations yet to come. 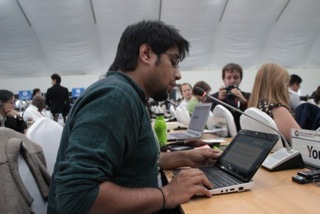 Categories: Convention on Biological Diversity, COP12 | Tags: Convention of Biological Diversity, COP12, Global Youth Biodiversity Network, Kabir Arora, Michelle Pazmiño, Pyeongchang | Permalink. The weather in Pyeong Chang (S. Korea) is very cold. The participants of Conference of Parties (COP) – 12 with their multiple agendas and contestations, counter statements are keeping the negotiation rooms very warm. The parties to convention are extremely thankful to Korean government for warm hospitality irrespective of the fact that everyone is freezing in plenary and working group tents. They are showing their deep gratitude by opening each and every statement they make (intervention as it is called in COP terminology), with ‘we show our gratitude to Korean Government for being a warm host’…blah, blah, blah. I’m sure the Korean government must be tired of listening to the same thing over again and again. Ah! And then they thank the elected chair and keep reminding her that they will be very supportive. Last day I was following the Working Group –II (Convention on Biological Diversity) where the first reading of decision draft text was undertaken with discussion on item number: 19 on the agenda of draft text i.e. Article 8 (J). In addition to the first reading of draft text, the parties were also supposed to undertake the mid-term review of implementation of Article 8 (J) in their countries. While most countries from developing global south very nicely avoided the review and came up with recommendation of replacing the term ‘Indigenous and local communities’ to a more ‘appropriate’ term coined by UN Permanent forum of Indigenous Issues ‘Indigenous Peoples and Local Communities’. For many of us it may not mean anything but for international environmental governance framework every word and term matters. There was visible divide on the issue. While most developing countries preferred the term given by UN forum, Canada raised the red flag. According to Canadian negotiator the change in terminology will open a new Pandora box which initiate more issues and make the discussion longer. India while supporting the draft text on Article 8(J) actually asked for voluntary commitments according to the needs and local conditions of the country. Sujata Arora who is representing India (negotiator in Working Group II) shared the reason behind the statement and said that the voluntary commitments will give countries space to maneuver depending on the local conditions during implementation. The Article 8 (J) is about indigenous communities sadly, the agenda of representatives of indigenous groups who also give recommendations is dictated by the ones from Americas who are always present in big numbers. That was one of the others reasons of why India took this particular stand. 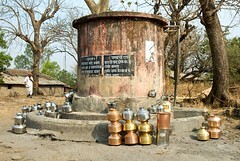 Still Indian stand is questionable irrespective of the fact that one size will or may not fit all. Certain homogeneity in the guidelines for implementation of article will help in evolving monitoring programmes and better comparative studies. Besides that according to her, India already has very strong provisions like Forest Rights Act which empowers indigenous communities to sustainably harvest the biodiversity produce. The National Biodiversity Authority through which access to the resources and traditional knowledge can be availed is another instrument which India has in place, to implement the given article. The domestic laws like those reiterate that commitments and road map of implementation should be voluntary as per her words. When asked about the High Powered Committee constituted by Ministry of Environment, Forest and Climate Change and their proposed amendments for most environmental laws in India, she declined to make any comment and said that she has no right to comment on domestic policies. I find it utterly strange as the domestic policies are going to be linked to international laws and conventions. India- for sure, will use the mentioned domestic instruments during the midterm review of implementation of Aichi Targets- especially in the conversation over Strategy Goal E: ‘Enhance implementation through participatory planning, knowledge management and capacity building’- Target 18 which includes Article 8 (J). South Africa like India also has domestic legislation and wants the implementation to be voluntary as otherwise if a new language and changes in terminologies is undertaken then they have to change the norms at home, this makes the implementation more tedious. The proceedings went on. And parties which include India, Brazil, Canada, Indonesia, Norway, New Zealand, Australia, Uganda and others were invited by the chair of the meeting to have a separate discussion to finalize whether the Convention on Biological Diversity will use ‘Indigenous and local communities’ or ‘Indigenous peoples and local communities’. Further adding to the update, South African negotiator emphasized a lot on ‘resource mobilization’ for ‘capacity building’ which if I may take liberty to declare that- it is very cliché term- is in use in environmental governance framework from a long time. It is the most over-abused term under the ambit of which the failure to achieve agreed targets can be clubbed in. Sadly we shall never have enough resources to implement the given goals, still the clock is clicking and something needs to be done. International environmental governance is driven by the spirit of volunteerism. The environmental governance mechanisms under UN & UNEP are toothless unlike the World Trade Organization agreements where countries can earn legal economic sanctions or boycott if they don’t implement the agreed framework in word and spirit. And that makes the feeble proceedings far more frustrating for those who want to bring change. If not anything else after following the working groups, by the end of COP 12 I’ll be using a lot of jargons which will be un-understandable for the most around me. I’ll also accomplish the art of complicating the matters further with the spirit of volunteerism. Categories: global warming | Tags: Agents of Change, Aichi Targets, CBD, Convention of Biodiversity, COP12, Forest Rights Act, Global Youth Biodiversity Network, National Biodiversity Authority, Pyeong Chang, Sujata Arora, UN, UNEP | Permalink. From Earth Summit in Rio in 1992 three legally binding agreements emerged i.e. United Nations Framework on Convention on Climate Change (UNFCCC), Convention on Biological diversity (CBD), and United Nations Convention to Combat Desertification (UNCCD). UNFCCC is a well known and talked about agreement and framework. Annual event called Conference of Parties (COP) for the same is much awaited for. For the others we know very little, I here will delve on the processes of lesser known Convention on Biological diversity (CBD). Different countries, other constituencies like inter-governmental organizations, civil society groups, representatives of indigenous communities, youth have gathered in highly controversial for massive infrastructure construction in ecologically fragile zone still known very well venue for 2018 Winter Olympics- Pyeong Chang in South Korea. I’m there too and will be here till 18th October, 2014. 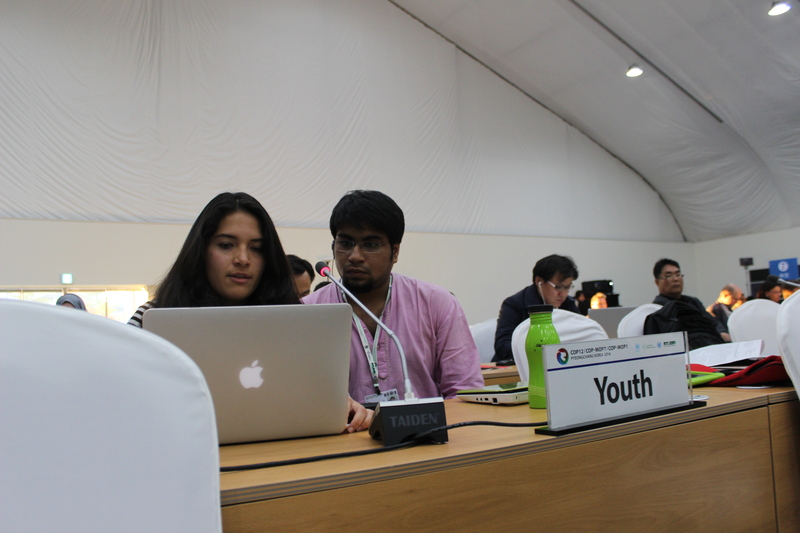 With the help of Global Youth Biodiversity Network (GYBN) – a lot of us got financial support to attend the prestigious COP 12. While the weather is very cold, everyone from official negotiators to civil society groups- young activists all seem to be very excited and warm. And it is quite impressive to see a balance of Global North and South especially in constituency of Youth which is very different from UNFCCC COPs. In Climate Change negotiations, there are more from Global North than South. The over-representation of North is absurd. At times many of the global north civil society groups have a tendency to hijack the agenda, while here in CBD the numbers are at par with each other. At a very basic level the negotiations will include midterm review of Aichi Targets which countries have committed for the decade 2011-2020. We are in the October of 2014 and the performance against almost all vague targets is dismissal. Still there is hope. The optimism of achieving some desirable results by the end of 2020 was also reflected in the words of Malta Qwathekana, the CBD primary focal point from South Africa, during the interaction with the Global Youth Delegation. All the negotiations will be circling around provision of ‘adequate predictable resources’ for achieving the stated targets. That’s definitely not good news, as in past too- countries set ambitious targets for the decade 2001-2010 but failed to reach the desired outcomes because of ‘lack of adequate predictable resources’, hope is that we don’t miss another decade in the whirlpool of conflicts over resource mobilization. During the present two weeks the Meeting of Parties (MOP-1) will begin for Nagoya Protocol focused on access and benefit sharing which was adopted in the year 2010. The Protocol will come in force this year and there will be wider discussion on it. Almost all countries have signed it, excluding three which includes United States of America. Many suggest that the process for Nagoya Protocol was more efficient and smoother as United States was not a party to it. 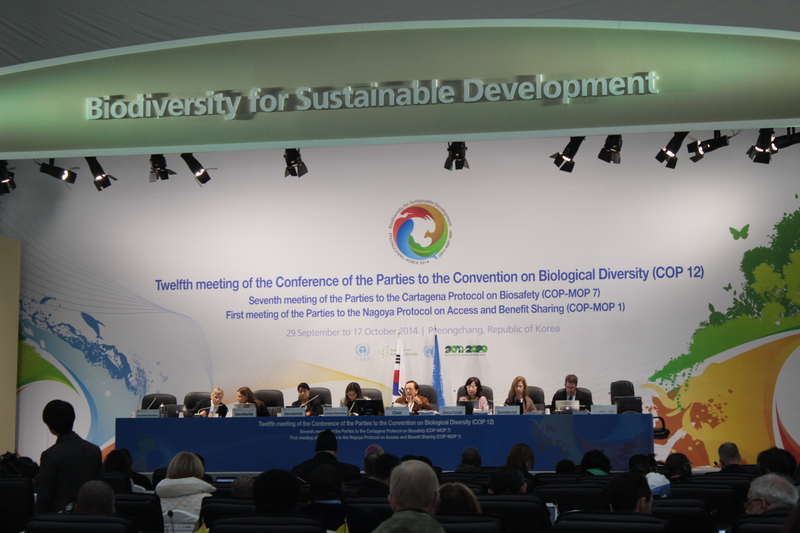 There will be other aspects related to biological diversity which will also be looked into during the COP 12. Hoping for sanity to prevail! With the mixed feelings looking forward to the COP-12 on Convention of Biological Diversity which formally begins tomorrow. Categories: global warming | Tags: .Nagoya Protocol, Access and Benefit Sharing, Agents of Change, Convention on Biological Diversity, COP 12, Global Youth Biodiversity Network, Pyeonchang, Yoga and Climate Change | Permalink.